As we continue with more 1968 Magic Mountain construction slides a huge thank you goes out again to Major over at Gorilla's Don't Blog for these amazing and rare images. Of course I presented the easier to get "Before and After" shots in my first two posts, it gets murky from this point on. 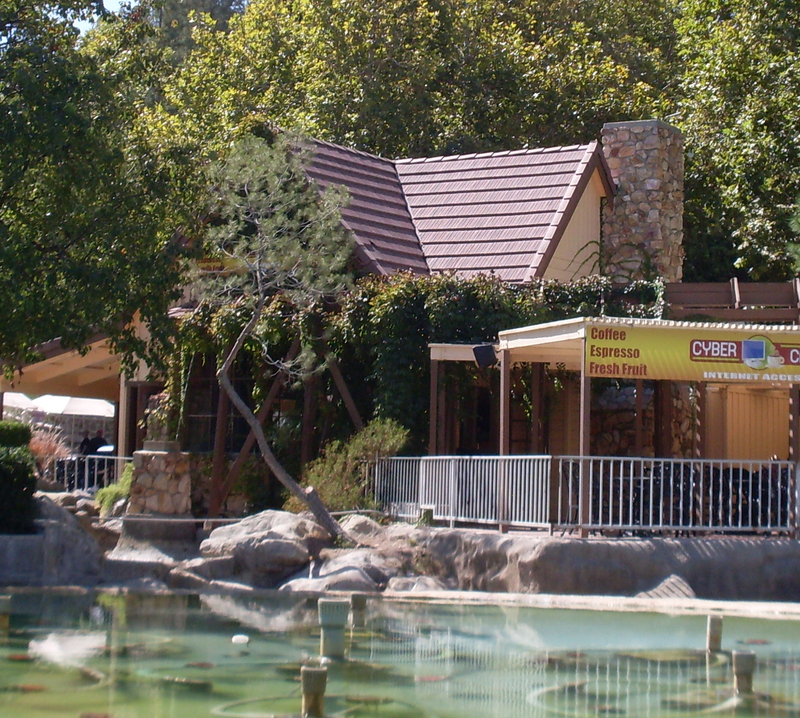 What you're looking at here is the queue building and part of the lagoon for "El Bumpo" - Bumper Boats! 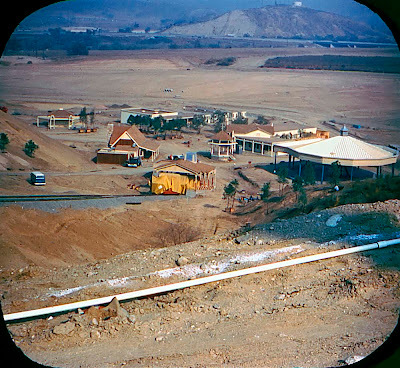 Since this attraction has been gone for decades, we'll have to make due with this vintage image showing El Bumpo in its prime. I see a lime green Metro Monorail out for a run too! This section is *close* to the shot above, but its actually a little further up the bend. Nice hood, looks like a 1968 Chevy truck? 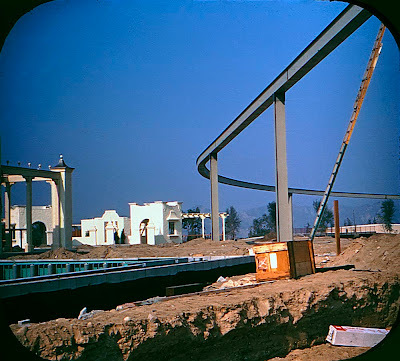 Down below is the Monorail beam, Casa de Regalos and the Grand Prix queue building. 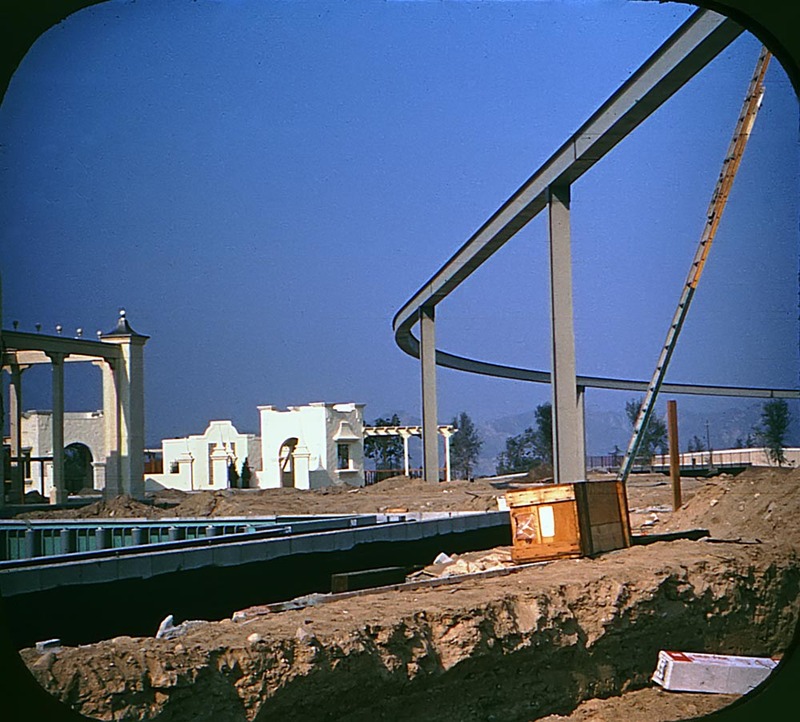 This odd angle is impossible to get today. The "Games Area" as shown on the 1971 map. The "Games Area" is one of the area's of the park that has changed very little. 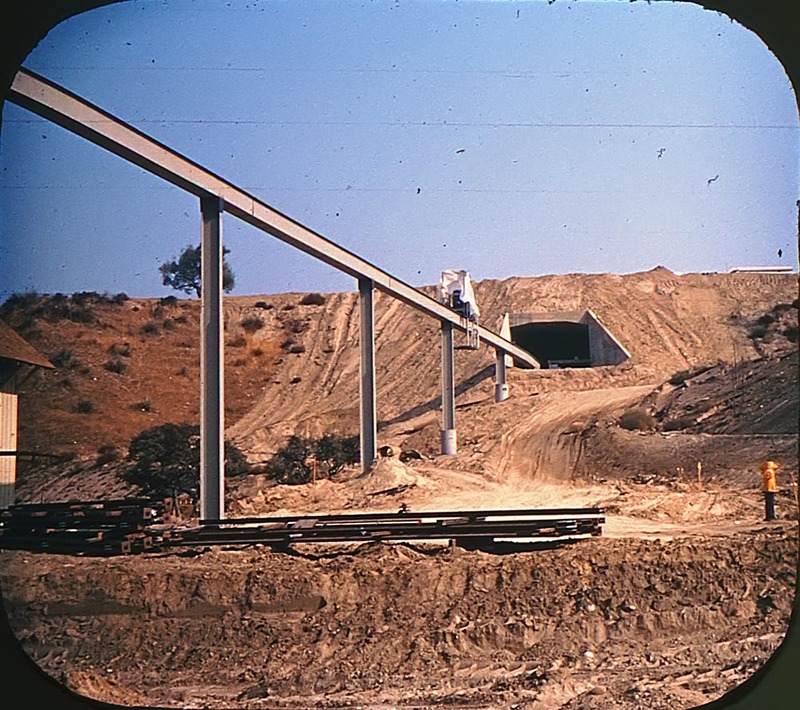 The Four Winds Metro Monorail station is IN the tunnel, the other side of the tunnel opens to the Log Jammer area as shown in part 2. Nice mule on the beam! Hike up the hill and you'll find the old beam. The old Four Winds Station entrance. This section was just past the Whitewater Lake Station, the restroom on the right is still there. 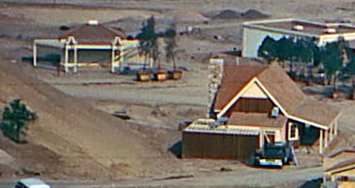 That's the maintenance spur center left. From November 2011 here's the maintenance spur, a year prior the trains were still on the track. September 2012, no more beam. Come back tomorrow (or soon) for part 4! P.s. For Major, in response to your question "Is Gold Rusher still there?" I took this video September 26, 2012. 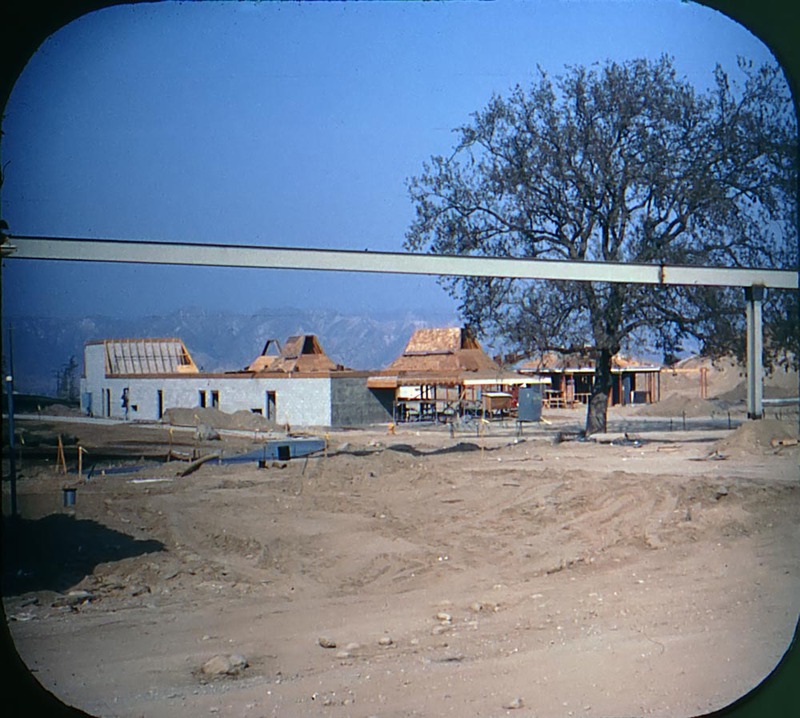 Picking up from yesterday's post with some awesome construction shots of Magic Mountain from 1968, today's first three view-master slides were taken inside the preview center/trailer. It's hard to tell from these indoor slides but the quality of these models is questionable, but they are so cool I'd die to have them! The detail looks a little better in this shot. I wonder where this model ended up? 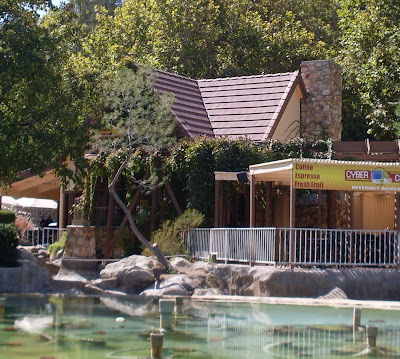 The Valencia Falls still look great, however the orange supports for Tatsu are somewhat of an eyesore. 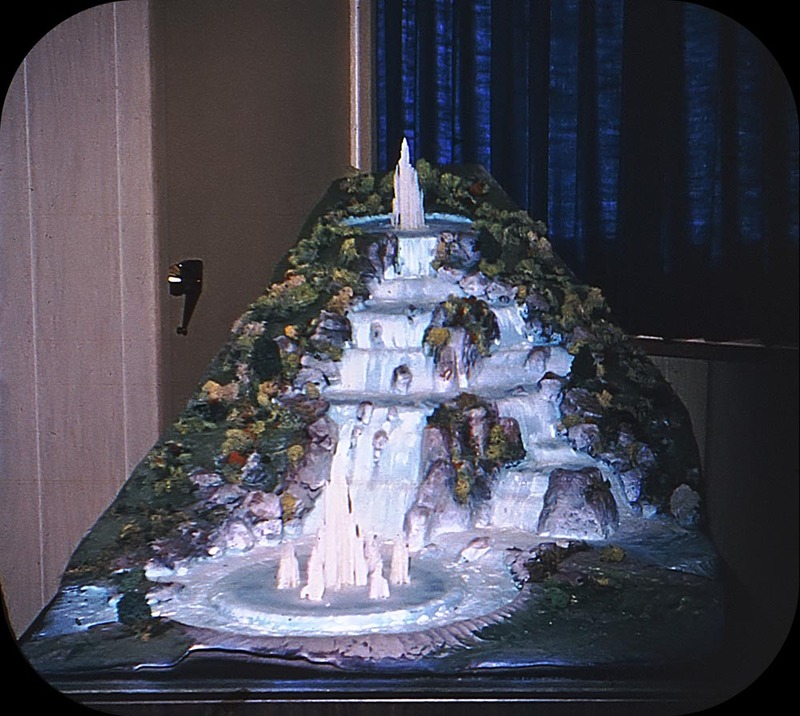 For Today's Before and After post let's focusing on the area just to the right of the Falls and the Carousel. 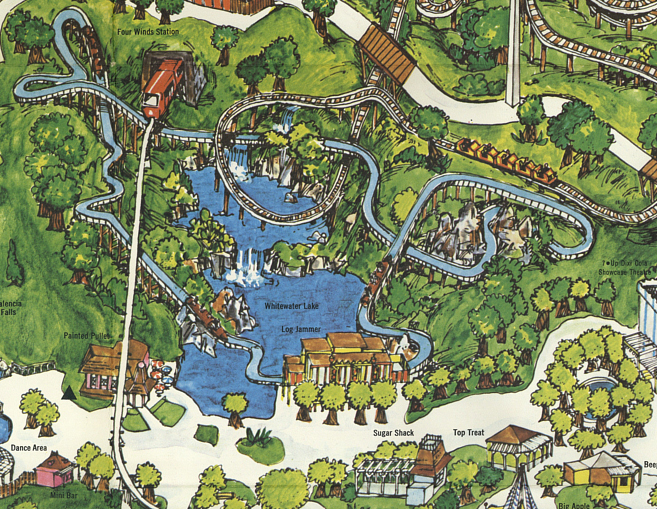 Most of this area is (was) covered by Whitewater Lake and the parks original signature attraction the Log Jammer. We'll get to the Log Jammer in a minute. First lets take a look at the "Sugar Shack" located in the lower center of the cropped section from the 1971 park map (link). 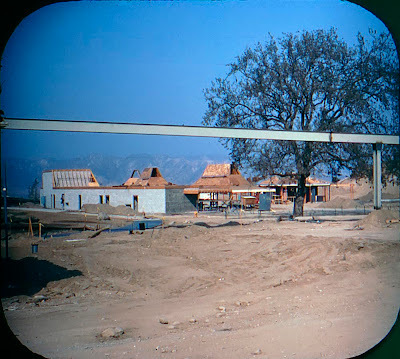 When I first viewed this view-master slide I had a tough time identifying this little building. There's a huge artificial tree to the right of it today and the Mooseburger Lodge is snug against it on the right side. However, this is most certainly the "Sugar Shack". Now part of "Sierra Territory" the little building has been renamed "Sierra Treats". 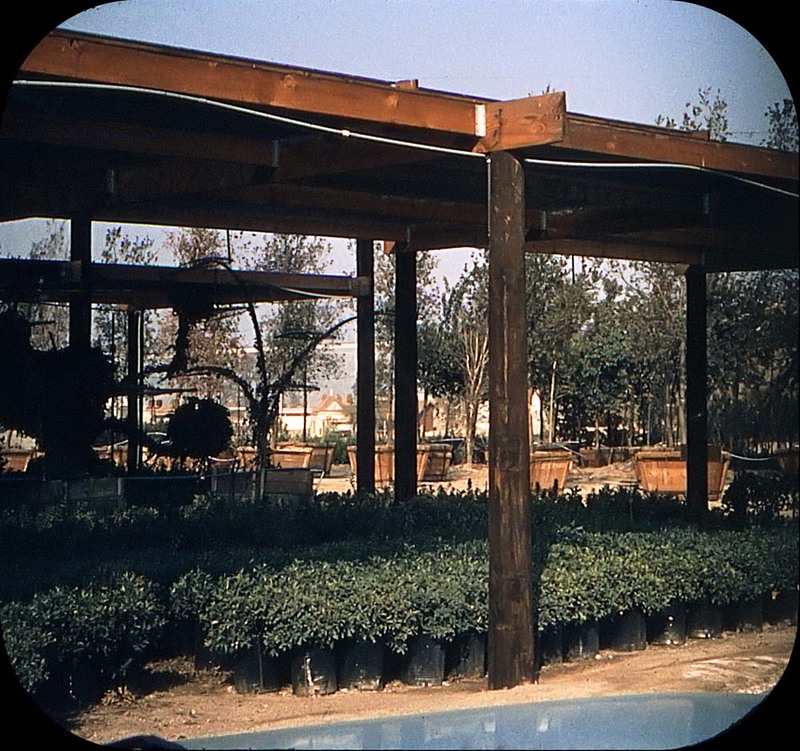 It lost the covered entryway on the right and the building on the left is now that huge tree. However, this little gem of a building still stands proud and looks great. I had a nice chat with an older lady working inside, she was thrilled to see the "before" photo (of course I brought it with me!). She said she remembered when it was the Sugar Shack! And naturally they still sell lots of SUGAR! 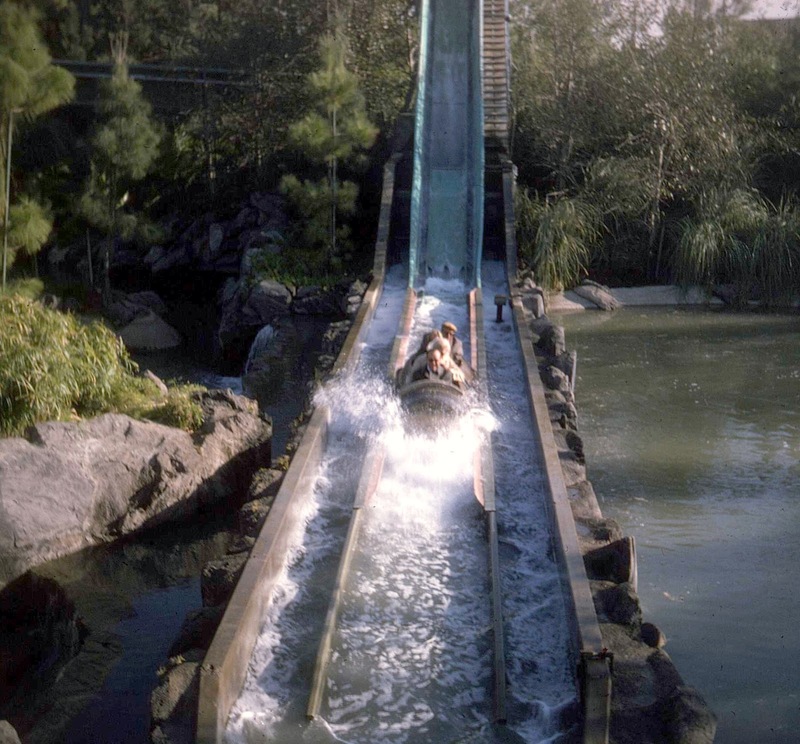 It is with great sorrow that I post the loss of the Log Jammer. The photo below is from November 2011, the attraction had just closed a few days before, closed FOREVER... The building is still there today, but the "Log Jammer" sign is gone and then entire flume system is gone. 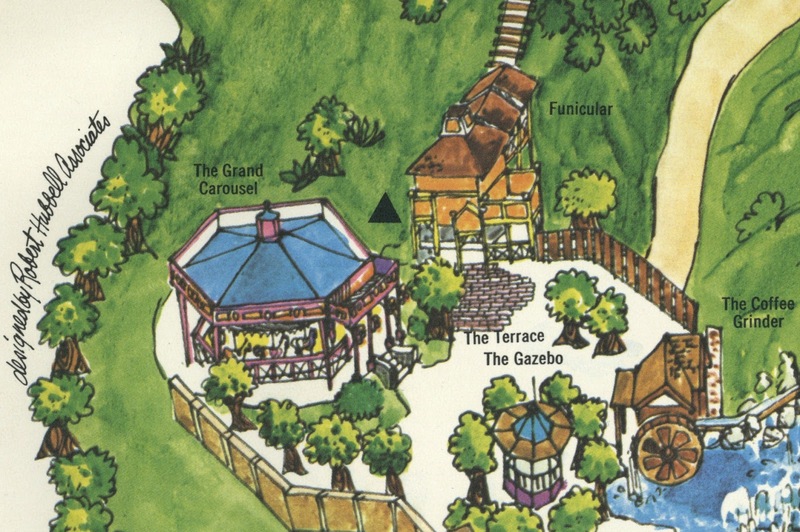 According to my new friend at the Sugar Shack, a new attraction, Full Throttle (link) will cover the entire area of the Log Jammer and more. 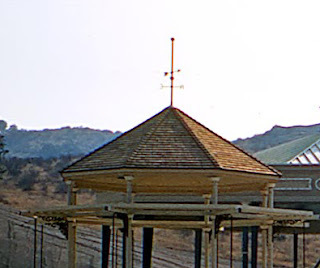 The "Whitewater" Metro Monorail station that was just across the path from the Log Jammer has been removed (RIP Metro) and I'm told it that area will be used for Full Throttle as well. 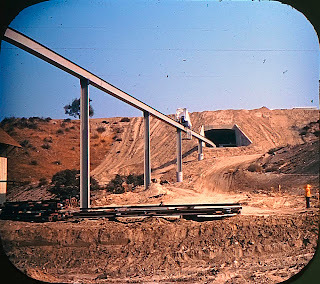 This 1968 view shows the main area of the Log Jammer, that's the tunnel and beam for the Metro Monorail. 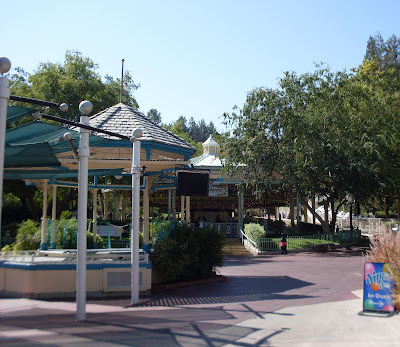 Ironically this shot taken September 26, 2012 shows the area has come full circle,or even backwards as the Monorail beam is now gone. 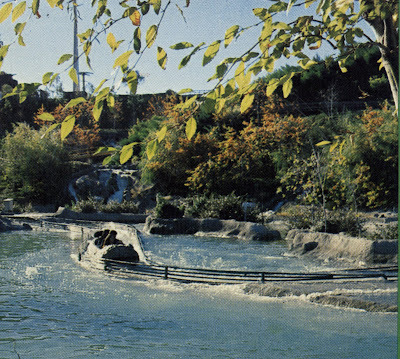 This photo taken in November 2011 show the last flume drop, monorail beam and part of the Whitewater Lake. Mid 1970's - good times. May 2010, still good times and you can pay 25 cents to soak someone! This September 2012 shot was impossible last November, I'm standing just to the right of the queue building. 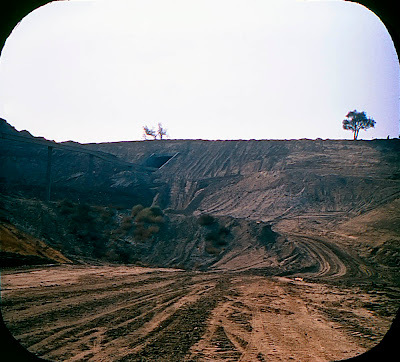 The lake and flume tracks are all gone (along with several mature trees). I was temped to go knock down all those little marker sticks, but I refrained. 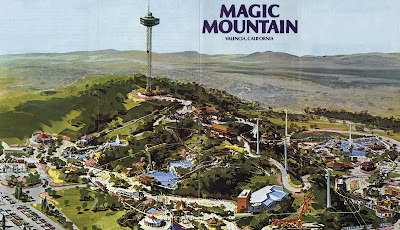 Lets take a look back at much simpler time at the Mountain. This early 1970's overhead tower shot shows the entire layout of the Log Jammer, it does sort of lend itself to a roller coaster I suppose. 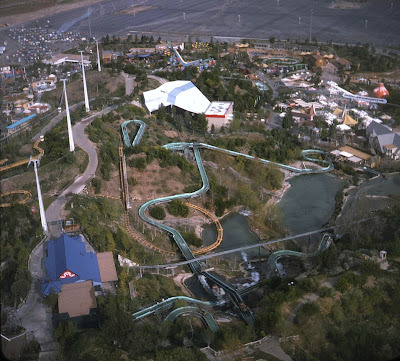 Notice the HUGE towers for the Eagles Flight skyway (yikes) and the long gone foot path down the front side of the mountain (Superman - The Ride is there now). 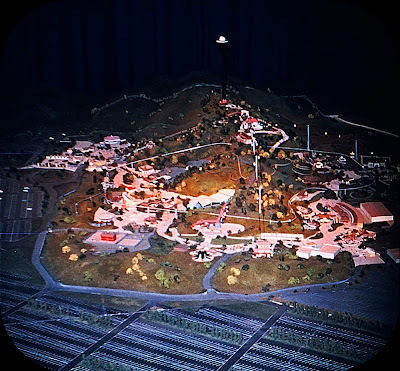 Last view-master for today's post. There's no way to get an after photo of this.. I do see some monorail beam in the background. Come back tomorrow for part 3! 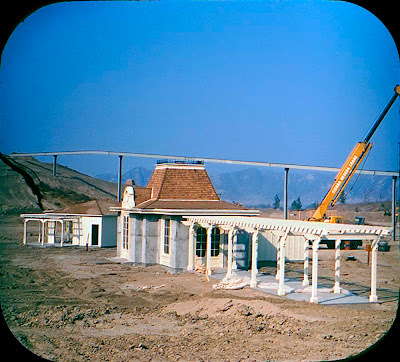 A little while back (OK a year ago) Major over at Gorilla's Don't Blog (link) sent me some amazing scans of the construction of Magic Mountain from 1968! 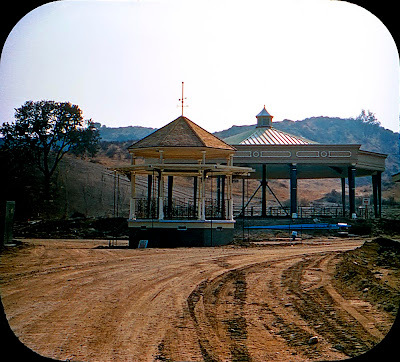 The park would open in May 1971 and I've heard construction started in 1969, however these are presented as 1968 and they definitely show the early stages of construction. First, Thank You Major! 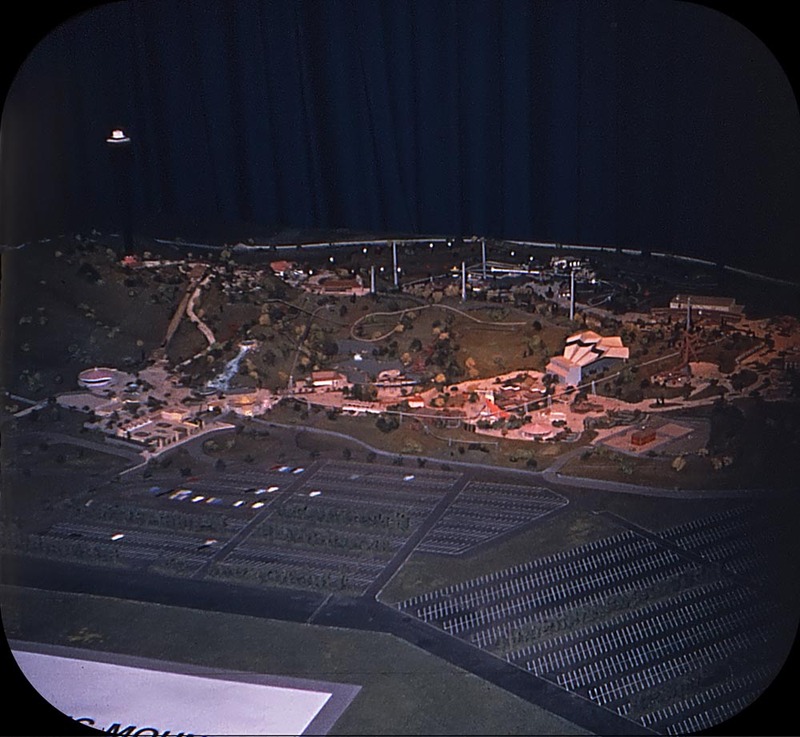 secondly, these are actually View-master's so lets head over to Majors to see them in 3D! There are a few shots from what must have been a showroom of some kind, possibly even a trailer? There are some cool models of the park (we'll see those in part 2) and this nicely framed shot of the concept art for the park. 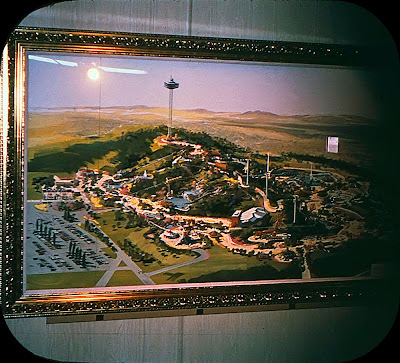 The same concept art can be found on the original park brochure given out during the guest preview openings in May 1971 - previous Inaugural Guest Preview Day post here (link). 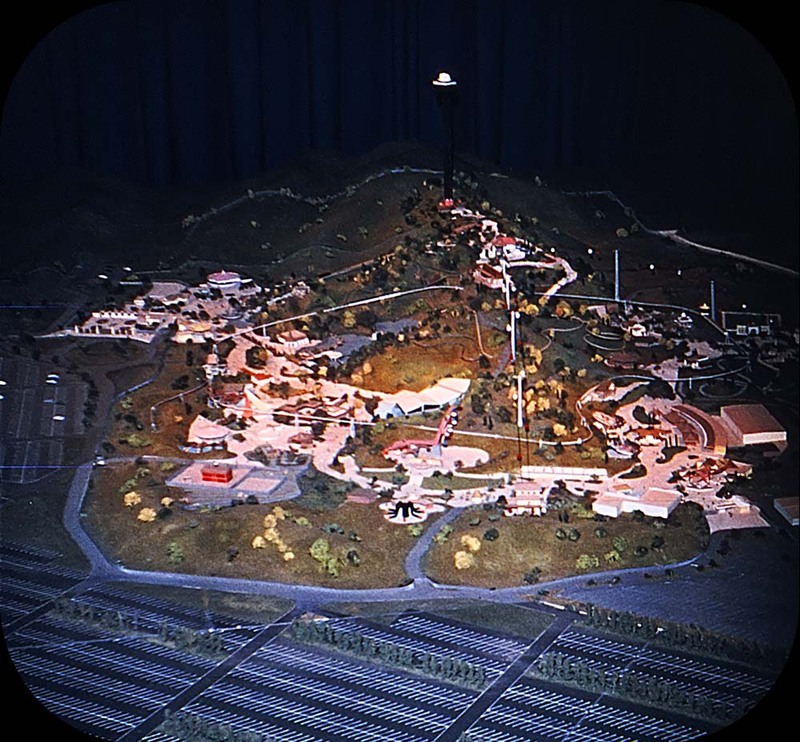 For today's "Before and After" comparisons, lets focus on what was originally the front left corner of the park. 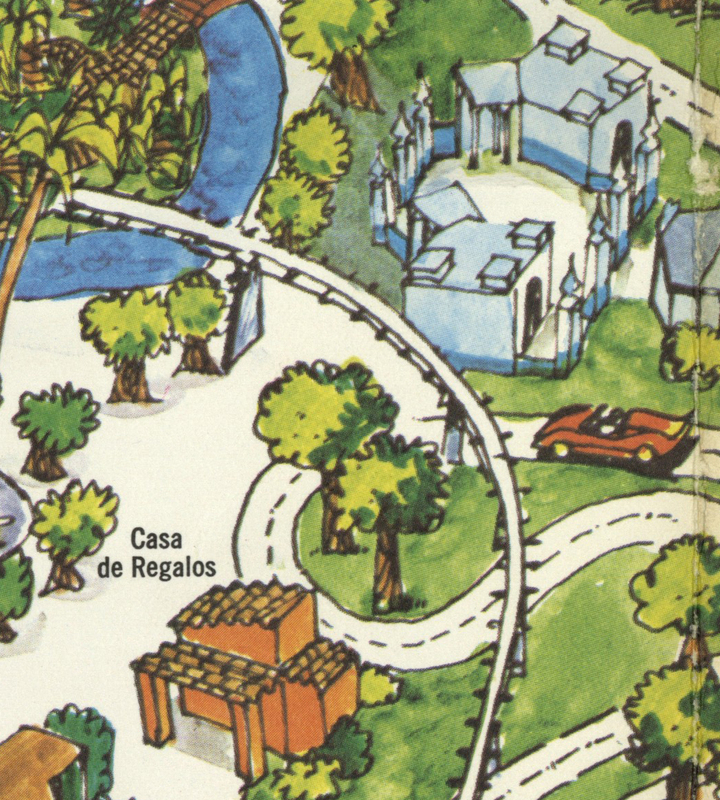 As seen here in this section from the 1971 fold out map (full high resolution 15MB 1971 map here - link). 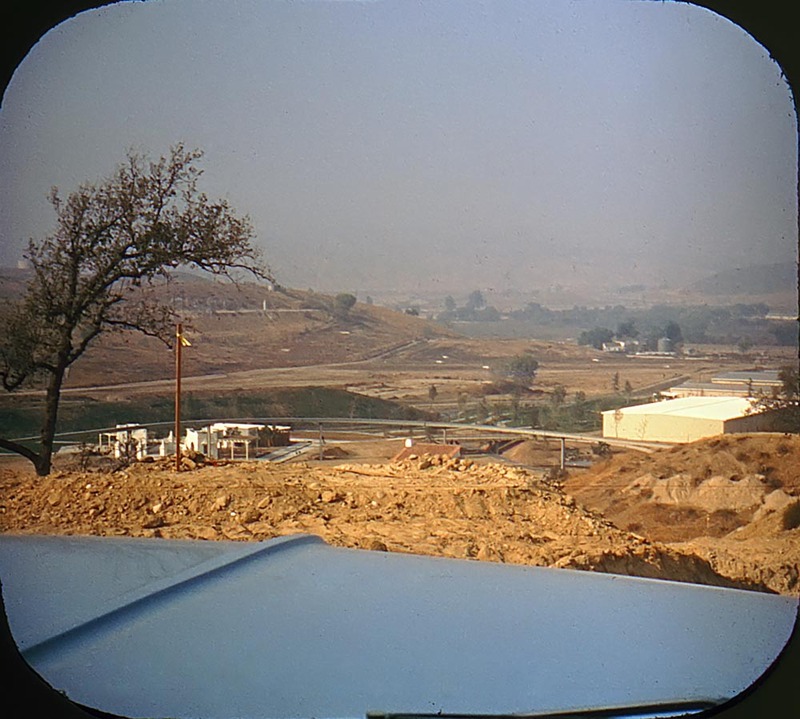 This was taken from the top of the hill, most likely from the base of the tower. This shot is impossible to get today, besides being covered in trees, there's two roller coasters in the way; Revolution and Tatsu. Fortunately there are a couple closeups from down below, let's check them out. Center left on the photo above, the cute little structure below was originally the Coffee Grinder. It was later renamed the Troll House and sold ice cream for decades. 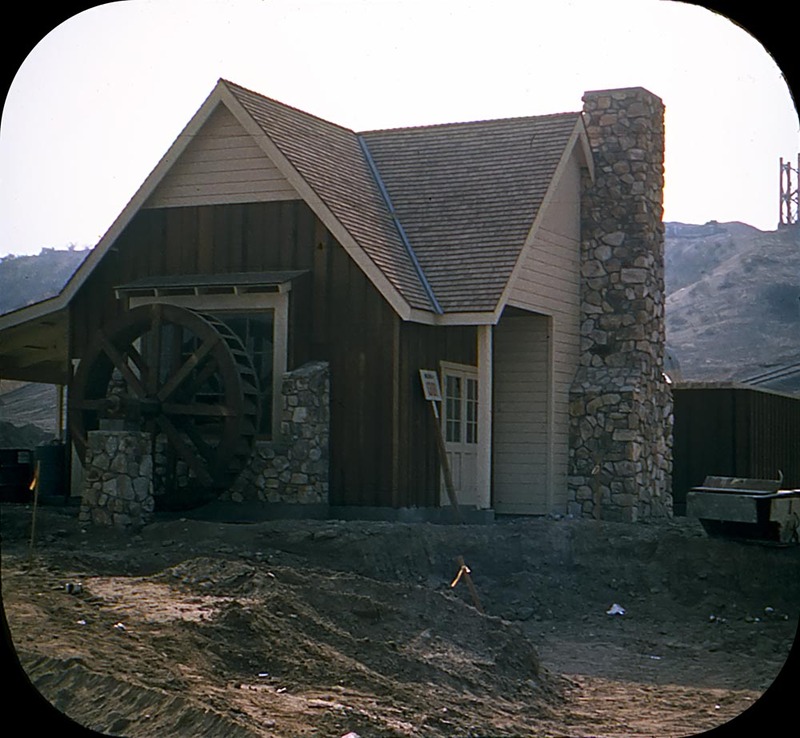 The waterwheel is long gone, but hey, water still trickles down the shoot! Ice cream and cigarettes, who else misses the 1970's? 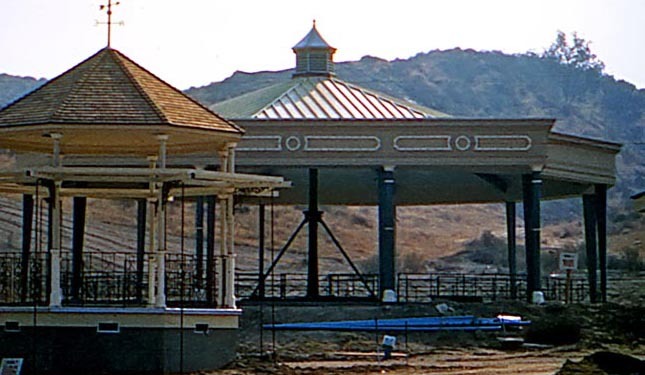 Here we've got a nice view of the "Grand Carousel" and "The Gazebo" later to become the "Carousel Bandstand". Where's Revolution, X2, Viper and Tatsu? This view is a little difficult to get today, everything is still there, but there's a large tree in the way and as you can see, The Gazebo grew some extensions when it became the Carousel Bandstand (I recall "Saturday, in the park, I wish it was the fourth of July" used to echo from the speakers in the bandstand when the park opened in the mornings). The top of the Gazebo itself hasn't changed much as you can see from these before and after shots. The Grand Carousel has yet to have been installed in the construction shot. The Grand Carousel today still looks great. 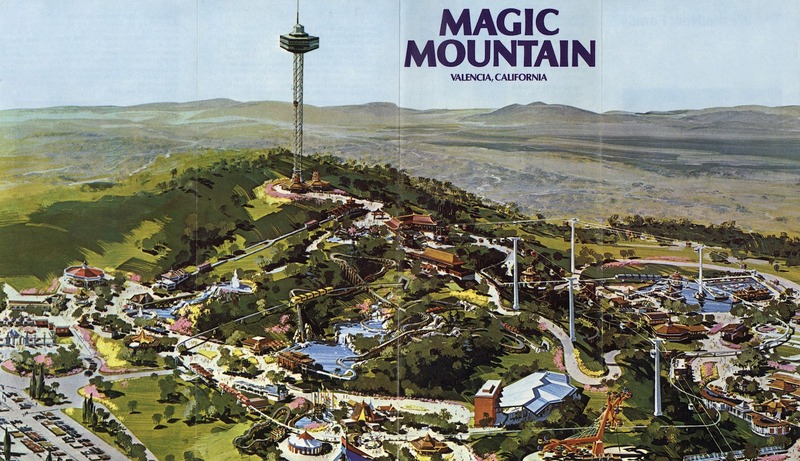 Did you know it's celebrating its 100th birthday this year? It's actually a 1912 Philadelphia Toboggan Company classic (link). 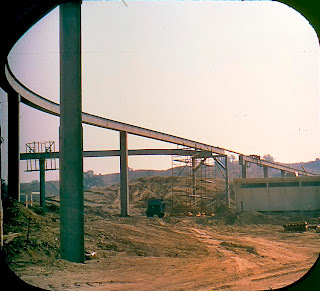 Again from the first scan, this is the back side of the lower station to the Funicular Railway. Since I can't get a picture of the back, you'll have to just see the front. 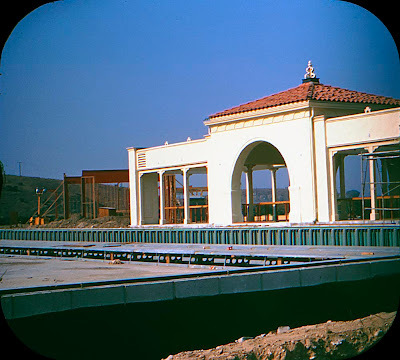 Trust me, other than a name change to "Orient Express" this building and attraction have not changed since 1971. (Today photo's taken November 2011). This sure beats walking around and UP the hill. Come back tomorrow (yes tomorrow!) 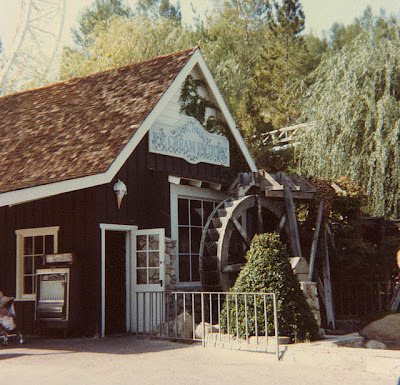 for Part two; The Candy Shack and the Log Jammer!